Juneteenth isn’t just a celebration of emancipation, it’s a celebration of our commitment to make it real. 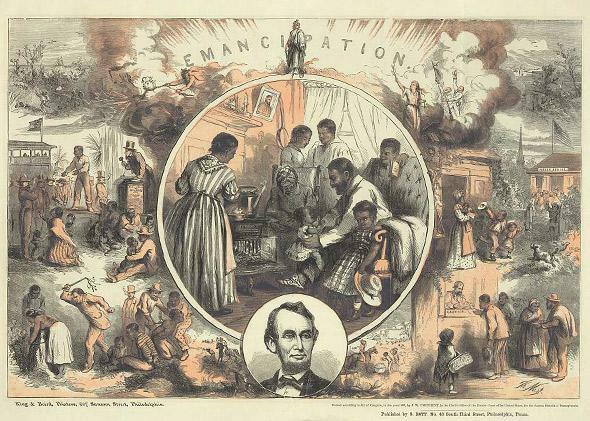 Thomas Nast’s celebration of the emancipation of Southern slaves with the end of the Civil War, 1865. Last year, Jamelle Bouie explained the significance of the underappreciated holiday of Juneteenth, which is celebrated today. The article is reprinted below. As such, for the next two years, slaves and slave holders lived at a far remove from the events of the eastern United States, including the surrender of Gen. Robert E. Lee and the Army of Northern Virginia in April 1865. Yes, it ended the war, but it didn’t end the conflict, as fighting continued on the far borders of the Confederacy. And so, when Gen. Gordon Granger entered Galveston, Texas, on June 19 to lead the Union occupation force, he wasn’t just faced with Confederate remnants (the Army of the Trans-Mississippi, for example, had surrendered only a month prior); he had to deal with ongoing slavery in defiance of the Emancipation Proclamation. This proclamation would form the basis for June the Nineteenth or “Juneteenth,” a holiday celebrating the announcement of the end of slavery in Texas. But neither violence nor the sheer size of Texas could stop emancipation from rolling across the landscape. And as it did, freed slaves began to commemorate and celebrate the event, both as an occasion for jubilee and as an act of defiance toward unreconstructed Confederates and other whites who maintained their grip on power in the state. The first public Juneteenth events occurred in 1866, preceding any similar commemoration of the Confederacy legacy in Texas. At these events, former slaves read the 1863 Emancipation Proclamation—subversively honoring Abraham Lincoln as the Great Emancipator at a time when white Texans saw the slain president as the destroyer of Southern “freedom”—sang spirituals, held games, and celebrated freedom. With the growth of the civil rights movement in the middle of the 20th century, Juneteenth began to reclaim its space as a central holiday on the black American calendar. It experienced a resurgence in 1968, following the “Poor Peoples March” to Washington D.C., which coincided with the holiday. Attendees from the event brought the celebration back to their homes, creating new traditions in cities and towns across the country. Juneteenth was made a Texas state holiday in 1980, and in 1997, Congress recognized June 19 as “Juneteenth Independence Day,” after pressure from a collection of groups like the National Association of Juneteenth Lineage and National Juneteenth Celebration Foundation. Thursday marks the 148th anniversary of the first Juneteenth. For now, it’s a niche holiday, celebrated by black Americans and a handful of others who know and understand the occasion. But it deserves wider reach. Indeed, I think we should add it to the calendar of official federal holidays. Insofar that modern Americans celebrate the past, it’s to honor the sacrifices of the Greatest Generation or to celebrate the vision of the Founders. Both periods are worthy of the attention. But I think we owe more to emancipation and the Civil War. If we inaugurated freedom with our nation’s founding and defended it with World War II, we actualized it with the Civil War. Indeed, our struggle against slave power marks the real beginning of our commitment to liberty and equality, in word, if not always in deed. Put another way, Juneteenth isn’t just a celebration of emancipation, it’s a celebration of that commitment. And, far more than our Independence Day, it belongs to all Americans.